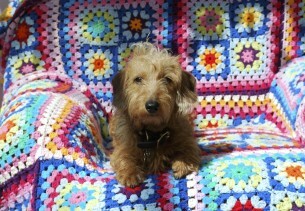 I'm not entirely certain that Scrabble (my miniature wire haired dachshund) is as happy about her new coat as I am! I came across a beautiful 'batt' of wool from the wonderful folk at Innerspiral (a Bristol based duo creating a world of wool wherever they go!) 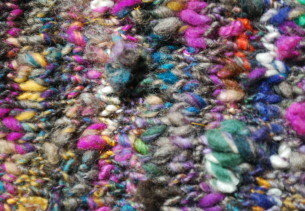 and decided to spin it into some soft 'art yarn' the moment I got home. The chunky art yarn was worked using 6.5mm needles so it grew really quickly. 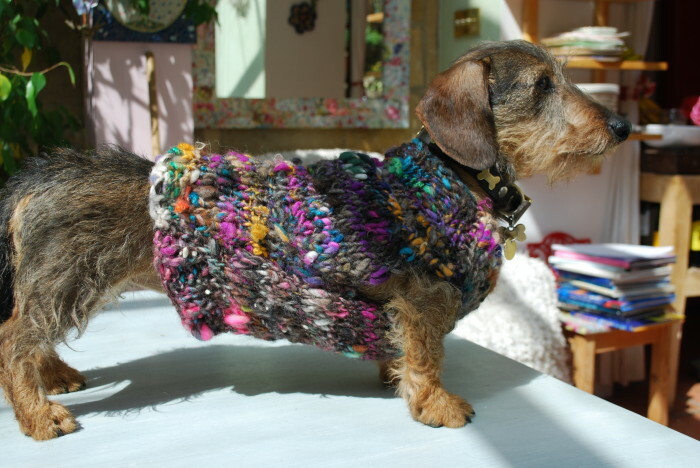 Coupled with the fact that it was being made to fit a miniature sausage dog it really took no time at all before I was able to fit it onto a rather reluctant 'Scrabble'! And now that I have made this one it's only right and proper that 'Mr Pickles' gets his one too.......all I need to do is decide upon the colour scheme!